After finishing the engine rebuild and getting it back in the car, I have started working on welding up some rust holes in the front fenders. 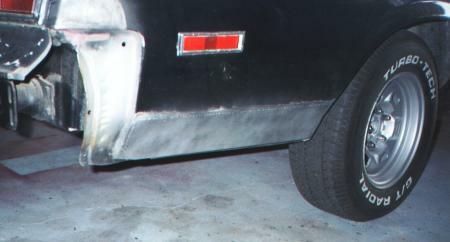 Shown above is the repair on the original passenger side fender. As I mentioned back on Page 1, the driver side had a rusty brown fender with a black spray can paint job. Luckily, I had a better fender off one of the parts cars but it too needed a small patch welded into the lower rear corner. From the factory, these 75-79 Novas had a wider front track width than the rear. That makes the front tires stick out farther than the rear ones and looks a bit strange in my opinion. So I decided to even out the track width on my '77 by using some wider wheels on the back. I picked up a pair of 14" x 7" rally II wheels (same style as the 14" x 6" ones that came on the car). The 7" wide wheels have 4-3/8" of backspacing as compared to the 6" wheels which have 4-1/8" of backspacing. That means that 3/4" worth of the extra 1" width is on the outside edge of the wheel -- just what I want to move the rear wheels farther outward and put them more inline with the front wheels. The weather was nice today so I sandblasted the 14" x 7" wheels, primed them, and painted them with argent silver rally wheel paint. I had recently bought some new 235/60R14 tires for the rear of my '74. The 215/70R14's I took off were still good so I mounted them up on the 14x7 wheels for the rear of my '77. These white letter tires sure look a lot better than white walls when used on rally wheels. After I get the front end aligned, I'll get a set of white letter tires for the front. A couple months ago, I cut the rust out of the bottoms of the front fenders and welded in some home-made patch panels. Just recently, I sanded the old paint off the fenders, fixed some minor dings, and primed them. I had thought about keeping the car black, but that shows dirt way too easily. Not to mention minor flaws in the bodywork. So I've decided to return it to it's original color, Metallic Silver (GM #13). 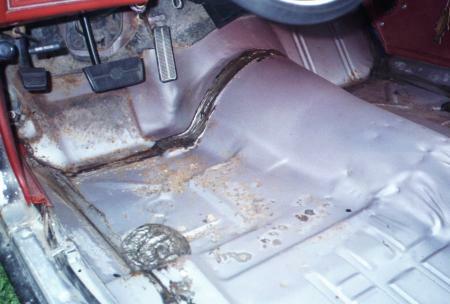 The trunk floor had a fist-sized rust hole as well as numerous other pitted and pin-holed areas from where the weatherstrip and tail light gaskets had leaked. I removed the gas tank (for safety purposes) before cutting out the rusty areas and welding in patches. Since reproduction trunk floor pans are not available for 73-79 Novas, I cut the patch pieces from one of my parts cars. I was lucky enough to have one that was rusted in a different area of the trunk than mine. 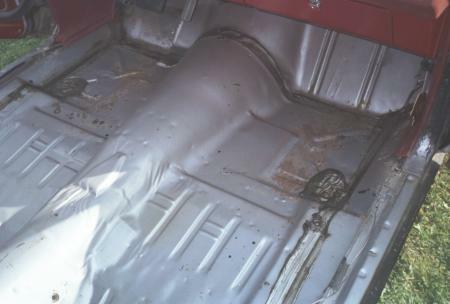 After welding in the patches, I coated the whole trunk floor with some POR-15 to prevent additional rusting. The gas tank was still in good condition (appeared to have been replaced not too long ago) so I just cleaned it up and put it back on. Next on my rust repair list was the lower portion of the passenger side quarter panel. It had several rust holes and rusted-thin areas. Luckily, all the damage was limited to the relatively flat area below the body line ridge so a complete quarter panel replacement wasn't necessary. I cut the quarter panel just below the body line ridge and welded in a home-made patch panel (about 7" x 24"). I've finally gotten around to putting the front fenders back on. I'm leaving them in primer for now, but I did paint the inside edges while they were off to save masking. I also painted the edges of the hood but left the top in primer. That way, when I'm ready to paint the whole car, I can just mask off the under-hood area and paint it with the hood closed. I had thought about painting the hood & fenders now and doing the rest of the car once I finish the body work, but I decided against that since I'd probably end up with a mis-match. 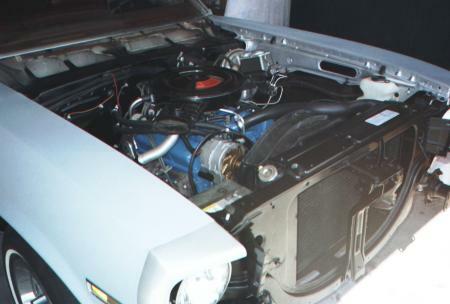 I re-installed the hood, front bumper, and grille shortly after the above photo was taken. I removed the seats and carpet to have a look at the floorboards. I was pleasantly surprised to find just some minor surface rust in the front footwell areas. A little clean-up with a wire wheel, some POR-15, and it's as good as new. The carpet was in pretty good shape too, considering that it's 26 years old. I gave it a thorough cleaning, sprayed some red fabric dye on the faded areas, and put it back in. 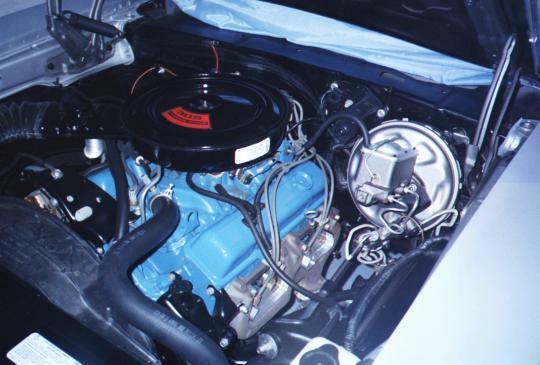 Here's a photo of the completed engine compartment. I put close to 500 miles on it since August and it's running great! It's now stored in the garage for the winter ... no more storing it outside now that the engine is detailed and the front-end is in primer. Before putting it away, I took out the seats since I will be having them re-upholstered over the winter. I also removed the doors so I can work on them over the winter too. They both have quite a bit of rust & bondo along the bottom edges that needs to be cut off and replaced with new metal. I'll also sand off the old paint, prime them, paint the jamb areas, and install some new weatherstrip and glass run channel felt.